As the weather is finally picking up I thought it was about time we talked nail polish to make you look more tanned. I think picking the right shade can really enhance a tan and make your nails pop at the same time. Any shade lighter than your skin tone is going to make your skin tone pop. Darker shades are going to make it your skin lighter. Bright white nails have been trending in the beauty world over the last year and show no signs of slowing down this summer. 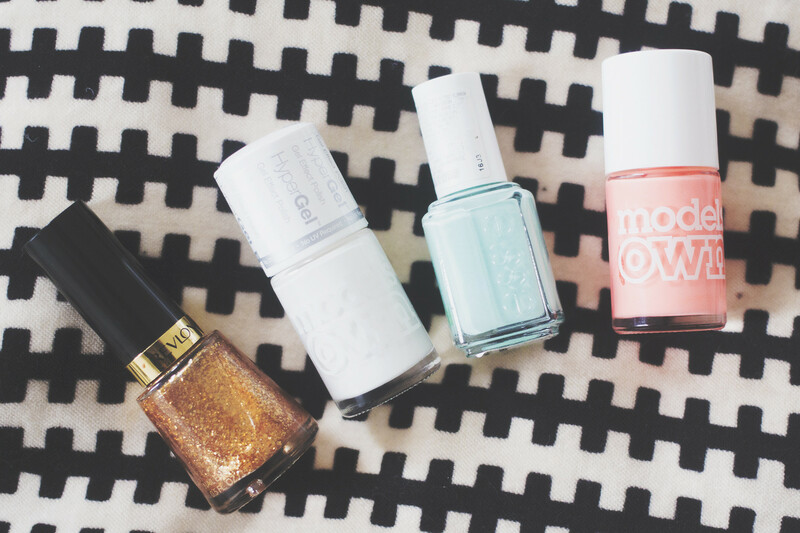 Picking a white nail polish is a lot harder than it sounds. You want something opaque and easy to apply. I really like the Models Own Hyper Gel Polish in White Light. It has as glossy gel inspired finish but if you applied the Models Own Matte Topcoat it would add an even slicker modern finish. Cool toned pastels will add warmth to the skin and give the illusion of a deeper, darker tan. I absolutely love mint polish - there are more minty lacquers in my stash than any other shade. However not all polishes are created equally and my mint polish pick is the cult beauty blogger classic Essie Mint Candy Apple. It’s just the perfect mint, not too pale and not too green. Lovely. My Mum swears by gold toned nail polish when we go away. Her talons are never not adorned with the shimmering shade. I struggle to wear colours like that but there is no denying they look great next to tanned skin. I’d opt for something more glitter based like the new Revlon Gold Goddess nail polish. It’s a unique rosy gold glitter polish that can be worn alone or as a topcoat.